Primogeniture (English pronunciation: /praɪməˈdʒɛnᵻtʃər/) is the right, by law or custom, of the legitimate, firstborn son to inherit his parent's entire or main estate, in preference to daughters, elder illegitimate sons, younger sons and collateral relatives. The son of a deceased elder brother inherits before a living younger brother by right of substitution for the deceased heir. In the absence of any children, brothers succeed, individually, to the inheritance by seniority of age (subject to substitution). Among siblings, sons inherit before daughters. In the absence of male descendants in the male-line, there are variations of primogeniture which allocate the inheritance to a daughter or a brother or, in the absence of either, to another collateral relative, in a specified order (e.g. male-preference primogeniture, Salic primogeniture, semi-Salic primogeniture). Some monarchies have succession rules contrasting greatly with primogeniture: currently, succession to the Saudi Arabian throne uses a form of lateral agnatic seniority, as did the Kievan Rus' (see Rota system), the early Kingdom of Scotland (see Tanistry), the Mongol Empire (see lateral succession) or the later Ottoman Empire (see succession practices). Absolute, equal, or lineal primogeniture is a form of primogeniture in which gender does not matter for inheritance. This form of primogeniture was not practiced by any modern monarchy before 1980. 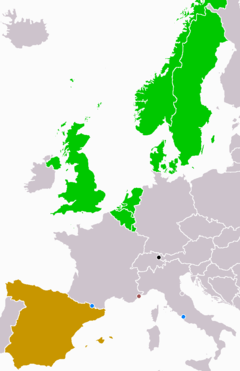 Monaco, the Netherlands and Norway also deviated from traditional primogeniture in the late 20th or early 21st century by restricting succession to the crown to relatives within a specified degree of kinship to the most recent monarch. With the birth of Infanta Leonor of Spain on 31 October 2005 to the then heir apparent Felipe, Prince of Asturias and Princess Letizia, Spain's Prime Minister José Luis Rodríguez Zapatero reaffirmed the intention of the government of the day to amend the Spanish constitution by introducing absolute primogeniture. Zapatero's proposal was supported by the leader of the main opposition party, the conservative Partido Popular, making its passage likely. However, Zapatero's administration ended before any amendment was drafted, and the succeeding government has not taken up the issue. The Prince counseled reformers that there was plenty of time before any constitutional amendment would need to be enacted as the expectation was to leave him next in line to succeed his father despite his elder sisters' continued status as dynasts; equal primogeniture was expected to first apply to his children. Felipe succeeded to the throne as Felipe VI, upon his father's abdication in 2014, by which time he had two daughters. Felipe VI has no son that would, absent the constitutional change, displace Leonor as heir-apparent. In July 2006, the Nepalese government proposed adopting absolute primogeniture, but the monarchy was abolished in 2008 before the change could be put into effect. In 2011, the governments of the 16 Commonwealth realms who share the same person as their respective monarch announced the Perth Agreement, a plan to legislate changes to absolute primogeniture. This was implemented when the necessary legislation came into effect on 26 March 2015. Under agnatic primogeniture, or patrilineal primogeniture, the degree of kinship (of males and females) is determined by tracing shared descent from the nearest common ancestor through male ancestors: Those who share agnatic kinship are termed "agnates", those who share descent from a common ancestor through males and females or through females only are "cognates". There were different types of succession based on agnatic primogeniture, all sharing the principle that inheritance is according to seniority of birth among siblings (compare to ultimogeniture) and seniority of lineage among the agnatic kin, firstly, among the sons of a monarch or head of family, with sons and their male-line issue inheriting before brothers and their issue. This was the most common primogeniture practiced in Western European feudalism, such as the Castilian Siete Partidas. It was practiced in the succession to the throne of England and then the United Kingdom from the Norman Conquest until 2015 when an act of parliament changed it to absolute primogeniture. During those 949 years of male-preference succession, six women succeeded to the English and/or British throne (not counting two who were contested). Male-preference primogeniture is currently practiced in succession to the thrones of Monaco, Spain, and Thailand. When an agnatic primogeniture system altogether excludes females from inheritance of the family's main possessions, it is known in Europe as application of the Salic law (see Terra salica). By the beginning of the 19th century, the royal houses of Bourbon (France, Spain, Sicily and Parma) and Savoy (Kingdom of Sardinia), among Europe's historic national dynasties, continued to completely bar women from succession. Later, the new monarchies or dynasties of France (under the Bonapartes), Denmark (beginning in 1853), Sweden (beginning in 1810) and the new kingdoms of Albania, Belgium, Bulgaria, Montenegro, Romania, and Serbia introduced Salic law. During this era, Spain (in the Carlist conflicts) and Portugal (in the Liberal conflicts) fought civil wars which pitted the Salic and female-line heirs of their dynasties against one another for possession of the crown. Most British and French titles of nobility descend to the senior male by primogeniture, to the exclusion of females, and agnatic cadets may bear courtesy or subsidiary titles. Notable exceptions in England include the Duchy of Lancaster, which is merged with the British Crown, which has included women in inheritance since the 1600s, and the Duchy of Marlborough, which has also included women in inheritance since the 1600s. See the article on Salic law for a clearer explanation of the differences between Salic, Semi-Salic laws and male-preference primogeniture. Under uterine primogeniture, succession to the throne or other property is passed to the male most closely related to the previous titleholder through female kinship. A male may also inherit a right of succession through a female ancestor or spouse, to the exclusion of any female relative who might be older or of nearer proximity of blood (see above for Spain's mid-twentieth century dynastic succession law). In such cases, inheritance depends on uterine kinship, so a king would typically be succeeded by his sister's son. This particular system of inheritance applied to the thrones of the Picts of Northern Britain and the Etruscans of Italy. Some kingdoms and tribes in Africa follow the same practice. This usage may stem in part from the certainty of the relationship to the previous king and kings: sons and daughters of a sister are his relations (mater semper certa est), even if they do not have the same father. The earliest account of primogeniture to be widely known in modern times involved Isaac's son Jacob being born second  and Isaac's son Esau being born first  and entitled to the "birthright" (bekhorah בְּכוֹרָה), but eventually selling it to Isaac's second son, Jacob, for a small amount of food. Although the veracity of this account has not been established through other sources, its widespread acceptance shows that primogeniture was sufficiently common in the Middle East for the account to seem plausible to the people living there prior to the Roman Empire. A case of agnatic primogeniture is exemplified in the French royal milieu, where the Salic Law (attributed to the Salian Franks) forbade any inheritance of a crown through the female line. This rule was adopted to solve the dispute over the legitimate successor of John the Posthumous, the short-lived son of deceased Louis X of France in favour of Philip V of France (brother of Louis and uncle of John) over Joan II of Navarre (daughter of Louis and sister of John), the Estates-General of 1317 ruling that "Women do not succeed the kingdom of France". In 1328, it was further elaborated, with the statement that "Women cannot transmit a right which they do not possess", to solve the dispute over the legitimate successor of Philip V's brother Charles IV of France (Edward III of England or Philip VI of France), though the former would have a stronger claim should proximity of blood be considered, which had never been the case in France since 987, instead as well of both agnatic-cognatic primogeniture or male-preference cognatic primogeniture and the resulting heirs. This dispute was among the factors behind the Hundred Years' War, which broke out in 1337. The crowns of Hanover and Great Britain, which had been in personal union since 1714, were separated in 1837 upon the death of King William IV: his niece Victoria inherited the British crown under male-preference primogeniture but, because of semi-Salic law, was not the heir to that of Hanover, which passed to William's eldest surviving brother, Ernest I. In law, primogeniture is the rule of inheritance whereby land descends to the oldest son. Under the feudal system of medieval Europe, primogeniture generally governed the inheritance of land held in military tenure (see knight). The effect of this rule was to keep the father's land for the support of the son who rendered the required military service. When feudalism declined and the payment of a tax was substituted for military service, the need for primogeniture disappeared. In England, consequently, there was enacted the Statute of Wills (1540), which permitted the oldest son to be entirely cut off from inheriting, and in the 17th century military tenure was abolished; primogeniture is, nevertheless, still customary in England. In the United States, primogeniture never became widely established, and division of interests in land (either by physical division or by concurrent inheritance of the heirs as tenants in common) predominates. 1 2 3 "Succession strategies in the Pyrenees in the 19th century: The Basque case". ↑ According to the Spanish Ministry of Justice, the default of the succession is by absolute primogeniture, but the titleholder may designate his or her successor or distribute titles among children, provided that the eldest inherits the highest-ranking title unless choosing to waive that right. ↑ Millar, Fergus (1983). "Empire and City, Augustus to Julian: Obligations, Excuses and Status". Journal of Roman Studies, 73. pp. 87–88. ↑ HN.psu.edu Smith, Adam (1776), Penn State Electronic Classics edition, republished 2005, p. 312-313.